The word of God in the Book of Proverbs 22:6 says, “Train up a child in the way he should go and when he is old, he will not depart from it”. A child that is given the right training will save his community, local government, nation and the society at large. Kodian Tennis Foundation is one foundation that Women Focus will always give kudos to their good work. Women Focus after taking stock of some women that have affected the lives of the young ones we think, Mummy Stella Epegu, the Founder/Coordinator of Kodian Tennis Foundation stands out. Women Focus wants to appreciate a woman, mother, sister and a pastor, Mummy Stella Epegu for the golden heart, she has towards the children to single-handedly raise a foundation that has taken the children as her first priority. Hardly, will you see a woman who will want to invest all she has in the lives of another man’s children for free or for the love of it. But Mummy Stella Epegu has done that. Children in their formative years are flexible to bend to anyhow you want them to be. An adage says “Give me a child of five years and I will form him a criminal or a saint”. We can always mould the children to be positive or negative based on the training given to them. That’s why if we take a look into our Bible, looking at the children that stood out like Joseph, the Hebrews, Daniel etc you will see that they were children that were given good training from home. Same is applicable to Kodian Tennis Foundation. Bringing the young ones to the limelight of tennis, we will see that in no distant time, Kodian Tennis Foundation will be a household name in the tennis world. Skill is very important to life and every human being, especially when you are starting it from the grassroot. A skilled person can survive in any environment, especially when you start at a tender age, the way Kodian Tennis foundation has done. The vision of Kodian Tennis Foundation is to provide free tennis training for boys and girls between the ages of 5 to 12 within Rivers State as well as the Niger Delta region and her mission is to curb youth restiveness and membership of cults by channeling their energies into learning of sports that will develop them and make them good and proud citizens of Nigeria. She added that one of the major concerns that Nigeria has is how to control youth related social vices in the country, that no age is too young for the children to be attracted to those vices as long as they have nothing positive occupying their minds. As an idle mind, it is said is the devil’s workshop. Hence, the foundation has set up this project to ensure that these kids are positively engaged in training both in short mid-term and long holidays. Thus, putting their talents and energies into productive living thereby generating a sound mind in healthy bodies for themselves. And also to inculcate educational, moral, spiritual and cultural values in the lives of the children. And also recreating an educational sports to help the teens boost their brain tissues and blood vessels for fast learning and retentive memories in educational pursuits. The foundation that was founded in 2007 and registered as non-governmental organization in 2012 has its primary organizational objective in developing and promoting tennis, most especially in Nigeria. Tennis plays an essential role in personality development, and also there is a great significance of the sport in overall personality development. “Catch them young” project has trained tennis players that have won laurels for the state. The children from the foundation have represented Nigeria in tennis in different parts of the world. 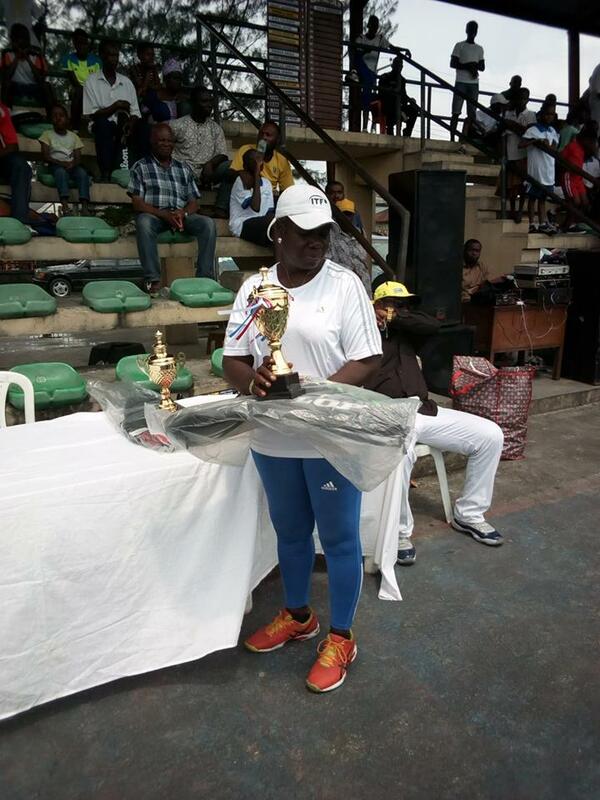 Mummy Stella Epegu, the Founder/Coordinator of the foundation has the commitment and determination to groom young tennis players for the state and country at large. When asked why she delighted in the training of the children for free, her word “I love tennis, I have passion for it. Besides that, I played tennis at my younger age that took me to national ranking of number 5, I also represented Rivers State in so many tournaments, adding that she has the desire to transfer what she knows to do well to other children. Of a truth such services rendered by the Coordinator of Kodian Tennis Foundation demands a word of appreciation from a sincere heart. Women Focus is using this medium to say a big “Thank You” to Kodian Tennis Foundation for giving meaning to young people. If the government can listen to militants who carry guns to destroy lives and properties, I think the government should also look at the direction of one who wants to arrest kidnapping, prostitution, pick pocketing etc from among the young people. Women Focus is using this opportunity to call on the government and well meaning individuals to partner with Kodian Tennis Foundation to sustain this good vision of bringing young people from dungeon to become stars in tennis and the like of Serena Williams.